UNESCO promotes the use of renewable energy sources (RES)and energy efficiency technologies and practices as a major tool to help respond to the challenges of climate change mitigation and adaptation. This includes the promotion of partnerships and exchanges of best practices through regional expert/decision-maker meetings, including at the ministerial level, and the development of information tools and materials addressing energy policy-making. 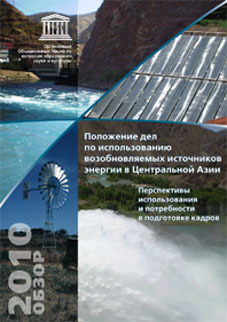 Within this initiative the Almaty cluster office Natural Science Programme has issued an e-publication in Russian entiteled “Use of Renewable Energy Sources in Central Asia. Perspectives and Capacity Building needs”. This publication was developed on the basis of research organized by UNESCO Almaty in 2009 in cooperation with experts from Kazakhstan, Kyrgyzstan, Tajikistan and Uzbekistan. The purpose of this review is to give general description of the current status of usage of renewable energy sources in Central Asian countries, paying special attention to the demand of each country for capacity building. In the framework of this research, experts describe the existing potential, especially human resources in the field of renewable energy sources in Central Asia. The publication clarifies the positions of most parties, interested in the development of this sector and describes measures for organizing and implementing teaching programs and trainings to promote capacity building in the renewable energy technologies in CA. Experts devoted much attention to analysing the results of interviews with stakeholders (state bodies, universities, non-governmental organizations, business organizations already working with RES,) to get a real picture reflecting the usage of RES and human resources in the sector in Central Asia.